I have had FM-phaser for several years, but this summer I had a chance to finetune it because I have now 5-6 antennas (=Triax-preamps with two outputs). With this device it is possible to fade out some local/semi-local FM-stations by phasing out the chosen signal. This phaser is at it's best when you have certain and constant signal-level of the QRM-station, which you want to fade out. It should not be too close and strong (= if tuneable with 1 meter-wire forexample) or too far and weak (=fading in/out a lot). I do not give here any technical data, only a description how it goes. I have two yagi-antennas for this job: Yagi-1 (vertical) is directed to the station I want to hear. Yagi-2 (horizontal) is directed to that station I want to fade-out (QRM-stn). First I adjust the signal of QRM-station from both antennas to equal levels in my receiver. Then I phase the QRM-stations's FM-signal opposite, 180 degrees, and combine them to my receiver. This means that the local station fades out and DX-station has free or almost free frequency to come up. 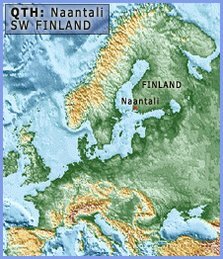 For example I have YLE Eurajoki 87.7 MHz (30 kW) 80 km away. I can fade it out for Es-stations (unfortunately no Es-conditions this year for results). Here is a video-clip of how I fade-out YLE Fiskars on 97.0 MHz (3 kW) 100 km away. It is constant here and blocks the frequency. I could have chosen better example (closer/more power) because this signal is beatable by strong tropo. However, there is a new Latvian local station to hunt on 97.0 MHz, Radio Vidzeme in Valmiera.This is the reason why I choose 97.0 MHz (vertical). In this clip I show the signal-level of YLE 97.0 MHz (3 red leds shining) - then I fade it out by tuning the phaser (one led shining) - and after that I take horizontal QRM-antenna away from combiner, which shows that QRM-signal comes back with V-antenna (3 leds again), because there is no combined signal anymore. I try later to make examples of closer stations. 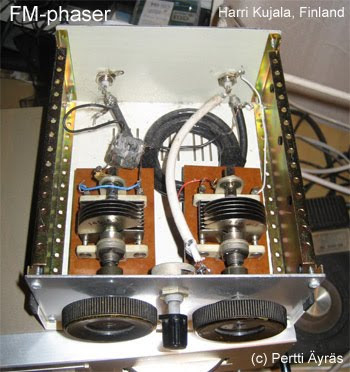 This FM-phaser is built by Pertti Äyräs, living close to me. 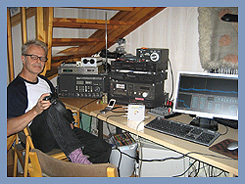 His QTH is almost impossible for FM-DX (Kaarina, 6 x 50 kWs only 3 km away). I do not have any technical data available of this for instant delivery, but I suppose I could get it from Pertti later. Let's see if I manage to hear this Radio Vidzeme during autumn tropos (no idea of their power)!! Mon 3.8.2009: Sardinia, Toscana !